The effect of Brexit on Global Payroll, Threat or Opportunity? The Chartered Institute of Payroll Providers (CIPP) held their annual conference and exhibition last week at the Hilton Birmingham Metropole. The main topic in delegates and speakers conversations was Brexit and its’ implications in the UK and Ireland. The CIPP Annual Conference & Exhibition provides payroll professionals with an opportunity to learn from influential leaders in the industry, valuable workshops and keynote speakers. 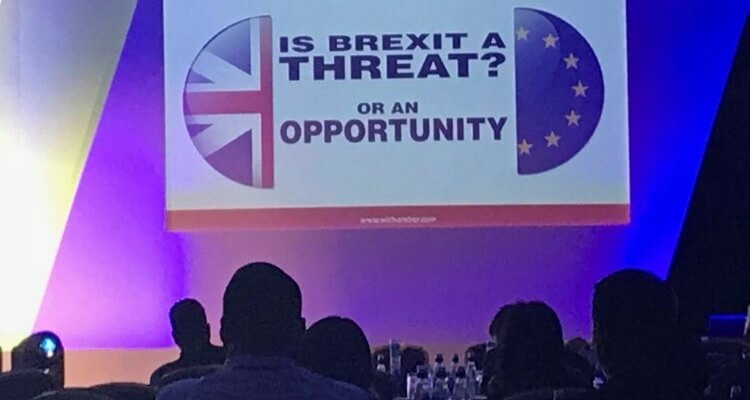 Although an extensive range of workshops, debates and keynote speakers were hosted, on topics ranging from the latest legislative payroll updates to developing your management skills, the main topic on delegates and speakers minds was Brexits and its’ implications within the UK and Ireland. 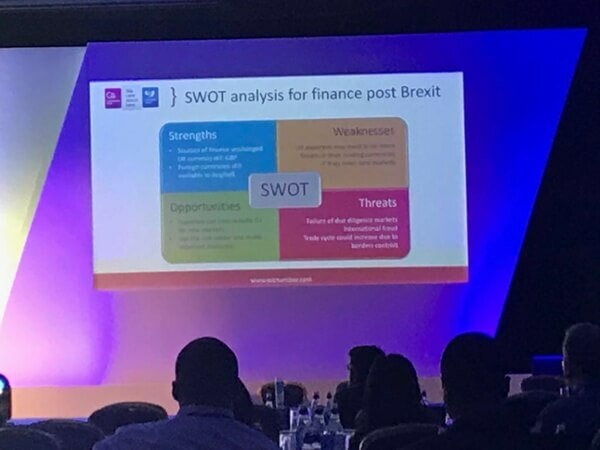 KPMGs’ Director of Global Mobility Services, Christopher Hawkes & Senior Manager of People Services, Zac Shingler took to the stage to speak about the ‘Practical Considerations on Brexit’. 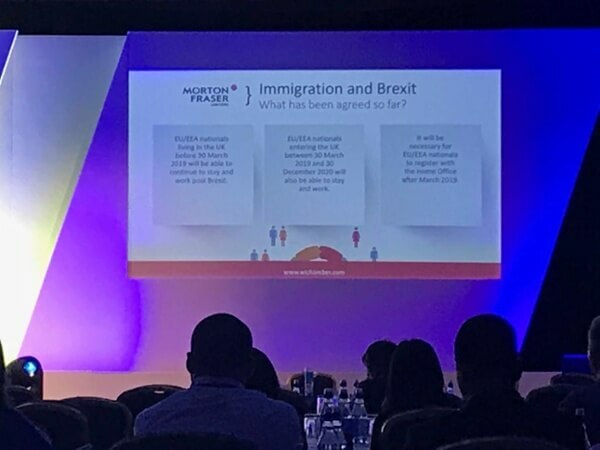 The session outlined the challenges Brexit will have on payroll and explored some of the practical solutions that could support the payroll community in what is the biggest change to, business, people and the nation in our lifetime. Regarding the route to market, specifically for product-based businesses, there will be a considerable number of impacts in terms of customs and excise, reporting, compliance and most importantly time. Depending on what decisions are taken for border control, products can be delayed at checkpoints. Naturally, for products with a short shelf-life, this can lead to a major negative impact on the business. UK companies are considering now whether they need to have a parallel base within in the EU for distribution, production etc. “After Brexit, how are you going to get your business into the EU and how are you going to get them into the UK? – How is this going to affect the supply chain? – How is this going to affect the cost of your product? – Should you be setting up an increase in your price if the cost of your logistics goes up by 5%? – Do you have margins in place to deal with it? To support the route to market and the set-up of bases for business in Ireland, 16 members of the Scottish Chambers including, Linda Scott and the Minister for Trade, Investment and Innovation, Ivan McKee are leading a delegation to Ireland on the week of the 15th of October to have bilateral discussions with the Irish government. They are conscious that Irish businesses may also need a UK base to support their route to market in the UK and hence the Scottish Chambers want Irish businesses to consider Scotland as their base for investment in the UK. Linda highlighted that the flow of payments and cash flow supports will be important. Companies should talk to their banks as they are ready or getting ready for Brexit. The banks are currently building out extra ways to support their business clients in dealing with the forms of credit needed to support international trade and different timelines arising from Brexit. Linda noted that there is often a lot of excitement by companies hoping that they will develop a market for their business in China. Regardless of how big and attractive the Chinese market is, the size of the EU market is considerable, closer and the ways of doing business more similar to the UK model than the Chinese model is. VAT is a key question. Under the current EU system, the application of VAT on the invoices is not needed due to the reverse charge mechanism. The VAT system has been in existence in the UK since 1972 and is worth Stg£130 billion per year so it won’t disappear. Thoughts at the moment in the market are that a reverse charge mechanism might be developed for some of the new customs and VAT that will need to be applied, but it has not been bedded down yet. Linda highlighted that Scotland and the UK are known as a quality trademark for business and there is considerable interest from Chinese companies in investing in the UK at the moment. Many of the current UK employment laws can be attributed to EU legislation. This includes the EU Working Time Directive which prevents EU employees from working over 48 hours per week. In more recent times, employment laws have been steered more so by British legislation rather than requirements by the EU. This means that while the UK may see some changes in employment law, the key aspects such as maternity and paternity law and collective redundancy, won’t see much change post-Brexit. In the current framework, UK employers have the ability to employ staff from within the European Economic Area (EEA) without the need to obtain a visa. It the UK votes to opt of the EU on the March deadline, these employees and employees from EU member states may experience travel and work restrictions in the UK. EU & EEA nationalists living in the UK before the 30 March 2019 will be able to stay and work post Brexit. EU & EEA nationals entering the UK between 30th March 2019 and 30 December 2020 will also be able to stay and work. It will be necessary for EU and EEA nationalists to register with the Home office after March 2019. In the coming weeks, Payslip will be hosting a webinar on ‘The Effect of Brexit on Global Payroll, Threat or Opportunity?’. Register your interest here, to learn more about the challenges currently facing Global Payroll professionals, the uncertainty of Brexit and the post-Brexit issues that payroll professional may need to face.